Gambit 7 – New Days of Wonder game in Europe! Sure of your smarts? Then bet on yourself! Think your neighbor knows better? Bet on her! 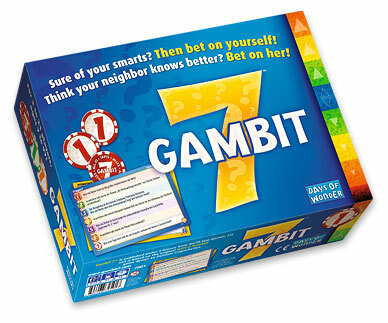 Gambit 7 is a trivia game in which players score points, not just for knowing the answers, but also by betting on those who might know better than them. In Gambit 7, all players write their answer to a question drawn from one of eight categories. All questions have a numerical answer, so even players that don’t know the subject matter at hand can make a wild, or sometimes educated, guess. Answers are then placed face-up and sorted, allowing players to either bet on their own answer or other players’. The winning answer is the one closest to being correct, without being higher! Derived from the award-winning Wits & Wagers created by Dominic Crapuchettes, and licensed from North Star Games, Gambit 7 will debut this year at the Essen Game Fair in October with both German and French language editions. Each edition features a large number of language and culture specific questions. In 2009, Days of Wonder plans to release the Commonwealth Edition, an English language version with questions pertinent to players from the British Commonwealth nations. As part of the licensing arrangement, this English language edition will be sold everywhere except North America, Norway and Finland. Learn more about the game on our new Gambit 7 web site ! This entry was posted on Monday, September 8th, 2008 at 15:26 and is filed under Gambit 7, Games, News. You can follow any responses to this entry through the RSS 2.0 feed. Both comments and pings are currently closed.